Great savings can be made on brand name fashion accessories by knowing where to shop and this certainly applies to handbags and associated accessories. If you're a handbag lover like me then one brand that you'll also probably love is Bosca, made from fine quality leather and excellent craftsmanship that will last for ever. Bosca make an impressive range of handbags, wallets and purses in both classic and contemporary designs and colors. textured leather cover is luxurious and durable. Decorative white stitched detail and metal studded trim accent its sleek flowing lines. Full length zippered top opens to reveal a lined interior with a zippered side pocket. 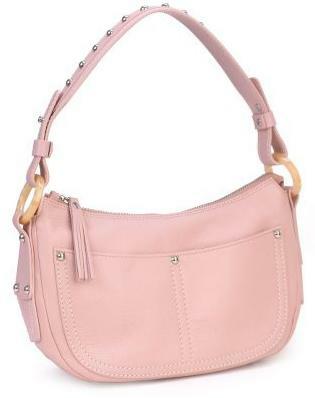 Matching rose colored leather handle fits comfortably around the shoulder. Bun footed rubber base completes the look. Portofino handbag is 10-1/4 inches wide, 6-inches high and 4-inches deep. Handle is 19-inches long. Ashford.com currently has the Bosca Portofino Rosa Leather Hobo at $109, a saving of 45%.